Who is Ready for Old Age? Are we ever ready for old age? Do we think about what our lives will be like at 75, 85, 95? It’s true that we are living longer. In 2015 the average age of death in the US was 78.74 years. Life expectancy for those born in 2017 is 76 for men and 81 for women. A survey from AARP concluded that being able to age in place in the comfort of their own homes is a big priority for seniors. It found that about 90 percent of people 65 and older want to remain living in their homes for as long as possible. The predicament is that the older people get, the more help they need. It’s agonizing to give up the car keys. It’s upsetting how fast technology changes and they can’t keep up with it. And how about getting used to slowly losing hearing, the body not responding the way it used to, or dealing with illness? And oh! those aches and pains. 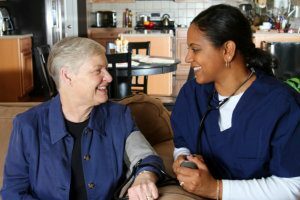 Avida Home Care to the rescue! Our care providers won’t be able to cure ills, but they will help elders stay in their homes and stay in control. They can do the driving so that the client will continue to be able to go where he/she wants to go. They can listen to the worries about changes in the body. They can help manage illness. They can help with technology so elders can Skype with the children who live far away and see how the grandchildren are growing up. They can help with continuing to be part of the community and perhaps help discover a purpose in life by finding ways to volunteer from home. They can shop for materials needed for knitting, crocheting, scrap booking. They can help with ordering books on tape and learning how to communicate with the younger generation i.e. TEXTING. These are just some of the ways Avida Home Care providers can help. This entry was posted in Uncategorized and tagged aging, aging in place, home care, quality of home care, seniors, staying in control. Bookmark the permalink.